Emil Guillermo: Why won’t Kamala Harris talk about being Asian on CNN’s Iowa Town Hall? If you haven’t heard, Kamala Harris is running for president. This morning, she’s just a percentage point behind the leading Democrat, VP Joe Biden, when the latest Washington Post/ABC poll asked people who they would vote for today. And that includes Trump, who has just 4 percent. Biden leads with 9 percent, and Kamala Harris has 7 percent. And that means everyone everywhere is getting to know the junior senator from the state of California. As we’ve known in the nation’s most Asian American state, Harris is articulate, intelligent, and has always had the charisma of a star. A female Obama type. Even Obama recognized that. And she’s like Obama in another way. She’s of mixed race heritage. She’s part African American, sure. But she’s also a South Asian American, the daughter of an Indian woman who immigrated here from Madras in 1959. With her parentage split between her immigrant father from Jamaica and her mother from India, Harris represents the real diversity of the New America. She symbolizes all that is good about America, immigration, and equal opportunity. She rallies blacks and South Asians, who have been among the largest Democratic fundraisers in recent campaign cycles. She’s the perfect counter to Trump, the president who relies on the loyalty of a mostly white base concerned about losing its grip on America. So why did she keep the Asian part secret on a special Monday night CNN Town Hall in Iowa, which introduced her to the news channel’s viewers as a kick-off of the 2020 campaign? The opportunity was there to blurt it out more than once. The opening question was on race and how to make America safer for people of color, immigrants, and the LGBTQ community given the current climate established by the Trump administration. It was a kind of a softball for her to advocate talking openly and candidly about the issue. So why no mention about her own Asian-ness at any point in the night? She had another opportunity when she was asked about her background. She talked about opportunity and the dream of her parents. A third time (not to be biblical), a proud Filipina immigrant, who identified herself as such, asked Harris to talk about the impact of her parents’ immigrant heritage. Again, no specifics about Harris’ Asian background, just the common ideals and values that her immigrant parents instilled in her. I admit to being disappointed. When was an Asian American given this kind of play at the beginning of a run for the American presidency? As an Asian American of Filipino descent, a San Francisco native, and Californian, I was hoping Harris would recognize her Asian-ness fully. 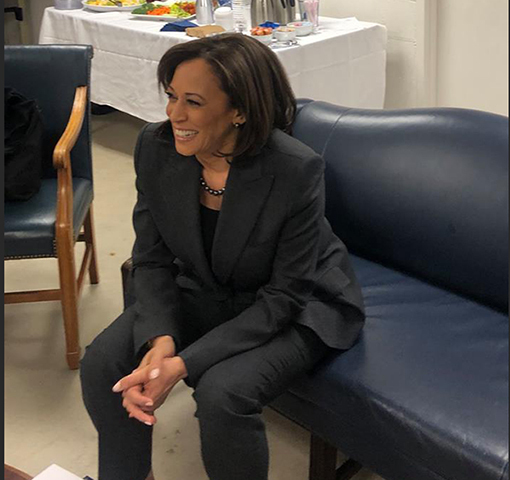 During the CNN show she discussed being a first as a woman, African American, or person of color to be elected in her various posts as California attorney general and San Francisco District Attorney. She never said Asian, South Asian, or Indian. It made me wonder why she was being so homogenized when she has never backed down in California from acknowledging her Indian roots. It’s a touching story. Harris’ mother Shymala Gopalan Harris died in 2009 at age 70 from cancer. She earned a Ph.D in nutrition and endocrinology at UC Berkeley, taught at universities around the world, and became known as an esteemed breast cancer researcher. On Facebook, Harris shared pictures of her with her mother as an infant, and as a little girl. On CNN, she didn’t mention Trump by name either, as I recall. He was only implied by his policy actions. Yes, the issues matter. And Harris was on target advocating for Medicare For All, gun safety, and challenging corporate greed, to loud applause. But Harris also is of Asian descent, and as a genuine contender for president of the United States, mentioning it means we all show up in a way we’ve never shown up before. And instead of fanfare, there’s not even a peep. Given that Trump is all about the sentiments of the new minority–whites, Harris represents the anti-Trump, racially. As I’ve said, she is the New America. Was she fearful of Trump’s xenophobic base? Maybe her handlers consider her race too polarizing, too soon. She did mention her mother by name in a recent New York Times op-ed on Medicare For All. In print, I suppose you don’t get the benefit of seeing Harris like on TV. So is the thought that on TV race is obvious, move on? You’ll recall Obama too had an issue early when talking about race. He hardly mentioned it. And we all kept waiting. Was it just so obvious race was irrelevant? Maybe in the era of Trump’s neo-nativist, white nationalism, a political figure like Harris on the post-Obama national stage needs to use race politics differently, strategically. Is she waiting for Trump to pull out a racist reference to match his “Pocahontas” name for Elizabeth Warren. And then go for it? With Trump, it’s all going to be hard to avoid. He’s all about his anti-immigrant base. Will Trump unleash “Birther II” against Harris? Don’t rule it out. But considering her credentials her smarts, and her empathy, Harris could be the wall that Trump can’t overcome. No doubt, Harris’ Asian-ness puts us in a unique historical moment. A person with Asian blood in the White House? We’ve never been closer. If she gains traction, who will the PRNBI (“Presumed Republican Nominee Barring Impeachment,” my new phrase for Trump) come back with to counter? Dump Pence for…..Nikki Haley? It’s early on the road to 2020, but wouldn’t that be a sight, Asian women on opposite sides, so close to the top in American politics? And their Asian-ness just a footnote. And perhaps that’s the way it should be.